It is 2 a.m. and I'm going to score 60 points with Dell Curry. Having unlocked the 1992-1993 Charlotte Hornets—you had better believe it was the first thing I did in NBA 2K12—I've started Dell in place of Kendall Gill and he is, well, he's beating his son. Stephen Curry's Golden State Warriors have no answer for Mister Hornet. A graphic pops up: DELL CURRY: 24 points. REST OF TEAM: 2. It's the second quarter. What I'm doing feels like a betrayal of the qualities that make NBA 2K12 a truly admirable game. NBA 2K has been one of sports video gaming's most admired series for about a decade; complimenting its realism still matters, but it's a quality that's been built with years of hard work. NBA 2K12 distinguishes itself for its smooth accessibility; I have, admittedly, very little exposure to the fundamentals of the sport. But NBA 2K12's improved playcalling and streamlined post-up moves do more than offer realism. They help me take ownership of it and write it for myself. When I want to. Right now it's 2 a.m., and it's Dell Curry Appreciation Night. Having dived into the game only this weekend, much of my time in NBA 2K12 so far has been spent with its "NBA's Greatest" mode, which is an absolute delight. Last year, in NBA 2K11 the "Jordan Challenge" had players driving themselves crazy trying to emulate the single-game stats of the NBA's greatest player ever. This year, the Visual Concepts development team wanted to introduce players to a broad swath of basketball's history, rather than dictating their participation in a narrow band of it. The games you play with the 1985-1986 Boston Celtics or 1971-1972 Los Angeles Lakers don't have any historical antecedent, they're ones you create. The Visual Concepts development team wanted to give you the feeling of popping in a tape of a great game from some alternate reality, and they succeeded. Commentary is something 2K Sports already does the best of any sports publisher, and here the audio team really answered the challenge of providing an engaging, believable call that discussed the era without pretending like it was coming from it. Kevin Harlan, Clark Kellogg and new addition Steve Kerr don't offer any hammy lines about top 40 songs or the price of gasoline. They are watching the game from the present, while offering context on the past, without being longwinded about it. Period-perfect broadcast motifs are only part of the authenticity. NBA 2K12 offers when you play its historic teams. Here's the other success of NBA 2K12's commentary: the announcers can interrupt themselves when the on-floor action requires it, and then return to what they were discussing before. It's a neat trick that works so well you really have to pay attention to notice it. But a hellacious Michael Jordan slam will not go unnoticed just because they're talking about the baggy shorts he wore over his UNC trunks. 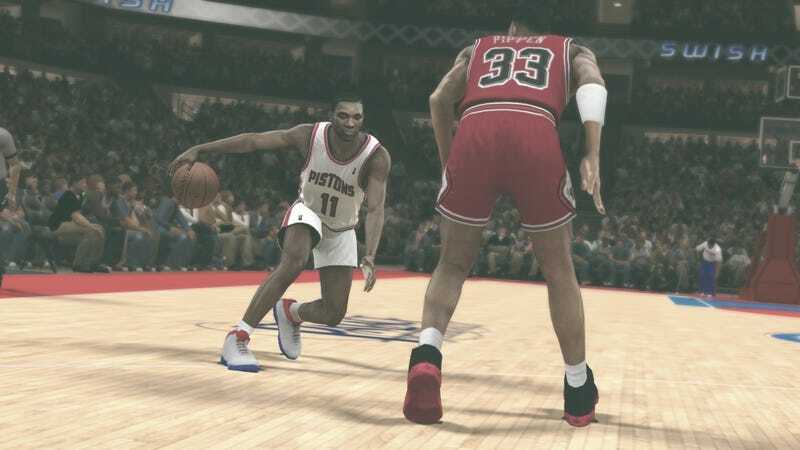 While all of the teams are available in every standard mode save online multiplayer, you only get the retro presentation if you play in NBA's Greatest, which restricts you to playing only one side of the 15 matchups. That's a bit of a disappointment. I've not yet completed all 15 games, but once I do, I'm not sure I'll be that fired up to go back and beat the 1985 Bucks with Dr. J just to see the washed out screen and 1980s chyron. It would have been nice to give players the option of playing any game either in the modern broadcast package or the one authentic to the oldest team on the floor. But period broadcast graphics, big afros and high striped socks are only part of the authenticity. Get ready to jump center before every quarter in your 1960s and 1970s games. You'll also see three-to-make-two free throws, which come as a pleasant suprise when your guy clangs his second attempt. As the 1971-1972 Lakers against the Knicks from the same year, I trailed by two and kicked the ball to Jerry West in the corner for a buzzer-beater that had me leaping out of my seat. I realized, mid-air, that there's no three-point line, and so it was on to overtime. Elgin Baylor's slam dunk looked a little too modern for me, especially on a goal that, unfortunately, could not be retrofitted for the era. But the teams do run set plays that are consistent with the times. This is another subtle encouragement for players to explore the streamlined playcalling windows and quick D-pad commands. It seems like Visual Concepts tinkers with this every year, but this year, it feels like they've really gotten it right. Calling specific plays for specific players takes only a few arrow or button presses more than running one from the quick menu of five bread-and-butter plays, which now includes a "run best play" if you're really pressed for time. Improved floor graphics show you how the play will run, without you having to try it 100 times in the practice mode just to get your timing down. I got a very smug, high-five-myself sense of satisfaction when I pulled off a simple ball reversal back to Curry and he bottomed it out. It's not a play that I could put together with the passing commands because I have no exposure to running it in real life. The other streamlining is in the game's post-up commands, a very welcome development given the hall-of-fame big men, like Patrick Ewing and Bill Russell, at your disposal. I've mentioned this before, but now that's only on one button, Y or Triangle, to get in or out of post play. Lots of novices ignored this realm of the game in the past because of the extra command set. Now, especially if you call a post play from the menu (getting your big man to back down automatically), going to the basket is a simple process of working the stick in the intended direction. It'll take a little time before you play like Dr. J in his prime, but NBA 2K12 offers an incredibly deep set of moves, shots, layups and, of course, dunks. Like the rest of the game, there's still a dizzying list of moves, fakes, counters, and counters to counters that you'll just have to learn by exploration. It's a game that can get staggeringly granular in how you command your players, and those with a long history in the series have a leg up. But by focusing on the big picture, which the playcalling and post game commands accommodate as much as they do detailed tactics, a novice is still able to create basketball that looks realistic and, more importantly, is fun. Defense has never been anything I've played too intelligently but again, NBA 2K12 helps me out with stronger AI and the means of quickly switching between different sets, like a zone or a halfcourt trap. At first I thought the trap was too effective. I sent two guys after the ball and played a third off the ball to deny a pass. Naturally, the double-team meant someone was free, and that guy ran to an open spot and the AI found him. In the past, the CPU's tendencies were a lot more predictable; I would have seen the obvious pass I was shading against. Here the game takes advantage of the situation as it develops and keeps you on your toes. While it's less predictable, that doesn't mean it has the same kind of ESP that past games had, especially as it comes in perimeter defense and defending your passes. The result is that I feel like my failures in the game—missed shots, bad passes—are wholly my responsibility and not the game's. Also, I can run the play back in my mind and know what I did wrong. That's something every sports developer should strive for, a game where your failures are as authentic and understandable as your successes. I've yet to get too deep into "My Player," NBA 2K12's career mode, or "Association," the game's franchise mode. That will be covered in greater detail in subsequent impressions and the full review a week from today. My Player has revamped the preamble to your career, making it more reflective of a stud rookie's career path and focusing more on getting you to the league, which is awesome. Association doesn't seem to have much done to it, probably because so much was packed into NBA's Greatest and My Player. You get to use NBA's Greatest teams in Association though, which I absolutely will be doing with Dell and Muggsy and Grandmama and my beloved bees. There's been a lot of armchair speculation about the damage the NBA lockout could do to this title. Indeed, there are no rookies from the 2011 draft on the roster, and it will remain static until the lockout ends. That cuts down on a lot of the variety you get playing the game online, or in the NBA Today mode. That's not something 2K Sports can control. What they can control, they have done extremely well. The effort put into this game is as obvious as it is admirable. Top to bottom, it is a better-playing game than its predecessor, which wasn't too bad either. I worry that NBA 2K12's strong appeal might plateau after unlocking all of the classic teams and maybe going two seasons into My Player. But that is a long way from now. Right now, it is 2 a.m., and it is Dell Curry Appreciation Night. It's Darryl Dawkins, and Dominique Wilkins Appreciation Night, too. It's basketball appreciation night.